...First thing tomorrow morning, that is, for new comics day! I picked up my print run of THE INEVITABLE COLLECTED EDITION this morning, and other than the one copy I came across (so far) with the first page reversed, they look exactly as I'd hoped they would! As of tomorrow, they'll be available at the Halifax and Dartmouth Strange Adventures locations (with Fredericton soon to follow), for a measly six bucks! I know that sounds like a lot in this depressed economy, but it's SIXTY WHOPPING PAGES! Trust me, it'll take a while for you to get through it. 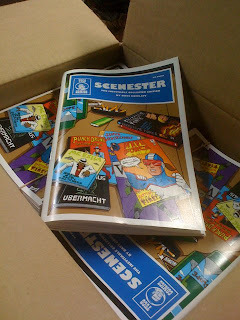 I'll also be selling SCENESTER (and hopefully, SLAM-A-RAMA 1 and 2, if they get back from the printer in time) at this weekend's Halifax Pop Explosion 'Zine fair, so you can come buy one from me in person. See you then! Tuco Comics, Now At a Store (Hopefully) Near You! The Official Tuco Comics Launch! Proofs Are Approved! Slam-A-Rama is GO!